ART CLASH WEEK 2! HE-MAN IN WIDESCREEN — BRETT WINS!!! › Forums › THE ART CLASH 1.1 › ART CLASH WEEK 2! HE-MAN IN WIDESCREEN — BRETT WINS!!! This topic contains 12 replies, has 7 voices, and was last updated by Steel 12 months ago. I just called the voting. Sorry about the delay. I’ve been very sick the last two weeks. Ugh. But anyway, I want to thank everyone for taking part and I thank you for the votes. Joe, you beat me on the critiques. Thanks for picking up the slack. I’ll be writing mine below. But before I get to that, I’d like to take a moment to see how everyone is doing and how you’re enjoying the Art Clashes. I wanted this to be formative in helping young artists get work by drawing regularly and forcing you to think outside the box you’re given for each art assignment you’ll be given when you’re doing this professionally. To that end, I have some plans to offer a series of tutorials; primarily how I do things. I’m also going to leave it open to anyone to submit a tutorial. But just see me first and we can discuss it and set it up. One of the things I think can be tough for younger artists…or older artists who want to improve, is knowing where to start. A finished piece of art can be tough to dissect and it’s often difficult to know where/how to get from point A to point Z (being a finished piece of art that looks generally like what’s in your head). And it literally is a series of individual steps of equal importance that, once developed, will guide you through this process. As a means of trying to help with this and considering I don’t have the tutorials set up yet, I was thinking of an interesting Art Clash for the coming week that may help you a bit. I’m thinking of picking your favorite character–or any character your prefer– and draw him in the style of your favorite artist. The caveat being you can’t say Batman is your favorite character and Jim Lee your favorite artist and then just draw Jim Lee’s version of Batman. This isn’t about the finished piece (though we’ll vote on them), it’s about getting to the finished piece and using the cartooning or visual language that particular artist used to help you get there. That means you’re going to have to look critically at all aspects of your favorite artist’s work in order to do that for your favorite character. You’ll be forced to look at proportions, how lights and darks are handled, line weight (if you’re inking them) and everything else. I want you to break down how this artist draws an eye, then draw your character’s eyes this way. Break down faces, hands, wrinkles in clothing, everything. And then make it work for you. I think this sounds like it could be incredibly formative and fun. I’m really looking forward to it and I had some great ideas for what I wanted to do next. Ok. On to the critiques. Steel – Steel, I’m so impressed with how you’ve grown. I love the face and how you arranged the composition of the piece. I think this piece is a big leap forward for you. You’re thinking graphically and you’re using blocks or black forms to frame your character. It reads well and there’s a great sense of action and dynamics to it And, of course, I see your very strong Jack Kirby influences. Well done. 🙂 In terms of areas of opportunity for growth, I’d like you to try to reference hands and I want to work with your more on building the forms BEHIND what we see. Check out his right hand holding his sword. This is fine. But look at the size of the arm behind it. The body works in a series of pushing and pulling muscles. One part of the body is forward, others move in the reverse direction. This is easily solved in this piece, by rotating his right arm BEHIND the body. You did a great job of rotating his chest, but if you kept his right shoulder joint consistent, it would have rotated away from the viewer. I’ll work with you a bit this week to show you what I mean. Rachael C – I love the colors and graphic quality of the this piece. You do a fine job of pushing Skeletor forward by placing him against the warmer background, but you could have pushed it further, I think. I’m not certain if you’re using Photoshop, but something that helps me determine tones and how well the final piece reads, is to make a new layer over everything, fill it with black and then set the layer properties to Color. This puts the whole image in grayscale and allows you to see areas where you could stand more contrast. Generally, if an image works in grayscale, it will work colored. Also, this is a different style from last week’s. If the other style is what you feel more comfortable in, I encourage you to feel confident enough in trying to fit the subject matter to your vision. I’m all for tying new styles and think, where possible, we can adapt our style to fit the project/subject matter, but I would have loved to see you try something in last week’s style…if that’s more interesting to you. I have been hired to draw a lot of different things over the years and not all of them were as interesting to me as others, but I’ve found I sometimes have to jumpstart/trick my brain in to being interested. Don’t let the subject matter force you out of your comfort zone, unless that’s where you want to go. We only have so many hours in this life. If you’re going to spend some of that drawing, do it in a way that inspires you. I hope that makes sense. James Q – I loved this piece. It felt some much like an old film cell to me. I loved the expressive left hand and the limited detail really works. The lightning does such a good job of separating the foreground from the background and adds such dynamics to the piece. If I had anything to offer as a suggestion, it would maybe be to put the lightning on a layer above the line work in the castle background. I don’t know if you’re using Photoshop, but I’d also suggest trying to the trick I mentioned to Rachael above. Aside from the lighting, this image is very dark. The lightning’s contrast then gives it too much focus in the piece. I think lightening He-Man would have pushed him to the foreground a lot. Truly love this piece! Knight – Knight, I’m so proud of how much you grew with this piece! I think this is leaps and bounds above what you were doing before and I think your figure work is AWESOME and I love the face! I will tell you this with total sincerity–I couldn’t have done this at nine. I’m proud of you! But I think some of the choices you made in the piece feel rushed. I think you could have given the lightning more form. I think you could have spent more time on developing the shadows. Use the carpenter pencil, or the drawing pencil I gave you! Use it to block in areas of shadows. I want to work with you on blocking in areas of black and how to give your drawings form. And I also want to work with you on inking. I know you spent a lot of time penciling this piece. I’d like to see you spend more time with your inking…just like your dad. 😉 And remember this: the foundation of a good piece of art, no matter how you plan on finishing it, is a good pencil drawing. Great job! Brett – I really am still not happy with my inks on this piece. Maybe it’s just that I’m used to digital, or maybe it’s just that my pens are old and drying out (I’m literally cutting this bristol board with a kitchen knife), but I feel like my inks deaden my pencils. Color, which I had wanted to add, would have only covered up my weaker inks. I think I need to do a better job with spotting blacks and forcing myself to NOT hatch literally everything. I really love your clean line style. And I like the graphic design quality of the piece. I know you had mentioned being rushed, but I think this is still a strong piece. That said, I’d really like to see you developing your under-structure, particularly in He-man’s legs. I truly believe, if you can become more confident with your figure proportions and anatomy, you’ll have a really, really cool style going. You can add the hatching or the gray tones if you like, but that’s just icing on the cake. But you have to get the main and plain things down first. I want you to really focus on anatomy and posing your figures in a natural way. I’ll make another suggestion that may help explain what I’m recommending. Think about the form/silhouette of your figures. I’m going to cover all of this in an upcoming tutorial on how I approach my work, but after determining placement on the page, the next big step in the process is developing the figure form. This is where we determine what we want to say with our figure. Is he sad? Is he powerful? Is he in the middle of drop-kicking the joker through a plate glass window? I find it works best to do a gestural drawing that is quick and very, very loose (this is not the stage for erasing), where I can work in the major forms. I like to dynamically push and pull the figure (if the context is suitable–sometimes people are just standing there) to get more out of my poses. I don’t move on to the refining stage until I’ve got a pose I generally like. Then I can work on refining proportions and anatomy. I really hope I’m making sense and not just rambling at this point. But if you’re finding a sort of stiffness in your figure work, or you just feel like limbs are “just there” on the page, considering elevating their expressiveness by being looser in the rough outline stage. Again, thanks to everyone who joined up this week. I’m so excited to see the growth as we continue to draw. And please feel free to let me know your thoughts on the next Art Clash challenge. Does the above suggestion seem like something that would be helpful and inspiring? Steel – Without a doubt the most ambitious of all of this week’s entries! The foreshortening on the hand is fantastic, the camera angle is bold and dramatic. I especially love castle Grayskull in the background, I also really like the little bits of red popped in. The super challenging camera angle and exaggerated foreshortening of the hand make accurate anatomy difficult but I am really impressed with the believable anatomy – my only critical observation is that the hair looks a bit like a helmet and the face looks a bit mask like. Injecting it with more fluid lines (draw from the shoulder not the wrist) might make it more life like. 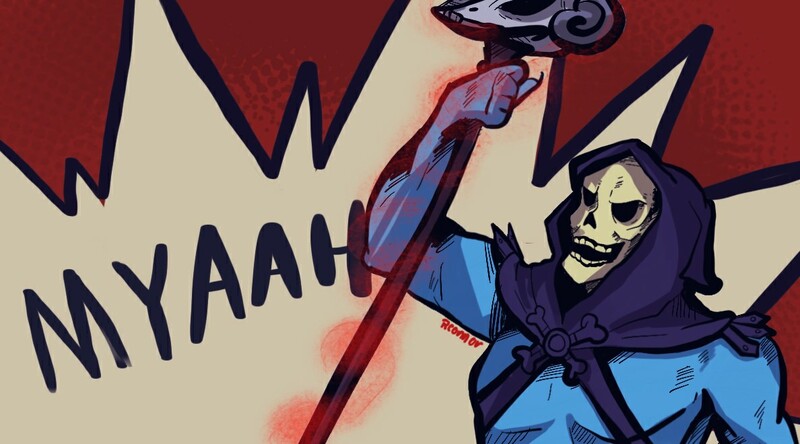 Rachael C – really wonderful classic skeletor look the blue skin really sells it along with the “myaah” I can almost hear him sneering at He-Man – good composition and use of the halftone pattern. JamesQ -This feels like a frame pulled from the 80s cartoon – if the character design was done today. The color palette and look of the background are wonderful the choice of doing gradients and detail in the background but flat colors in detailed line work on the character really sells the vintage look of the piece. Knight – Great to see more of your work – I really love the look of the belt and leg protection that you came up with. Your anatomy is definitely getting stronger. This feels like a really cool mash up of Conan and He-Man, I really like the longer hair. I think the lightning in the background is just enough to push the focus to the main character in the foreground – fantastic work. Brett – *got my vote* Bringing the heat (again)!!! Another really amazing piece – good action ✓ storytelling ✓ multiple characters ✓ background ✓ (fantastic) craftsmanship ✓ good use of topics requirements (widescreen) ✓. You checked all of the boxes that I look for. My personal favorite part of this is the technique on the background – it is subtle enough that it doesn’t pull attention away from the characters but it adds a level of depth – not only that but it is relevant to the scene and really immerse the viewer in the story. Self critique – While it isn’t what I set out to draw initially (i had planned on a battle scene more along the lines of Brett’s) I am happy with some aspects of this one. I think the anatomy is accurate (which has always been a weakness of mine) – the clean lines are a testament to my current focus on craftsmanship. I also experimented with using tone to create shadow instead of cross hatching and I am really happy with it and plan to explore that technique more in future drawings. Negatives – need to focus more on composition instead of just drawing the subject – try to tell a story and be realistic with what you can get done by the deadline. I hope you do something like this, Brett, but it could be a lot of work. In fact it was this post that urged me to join here. There is in fact a curriculum that I think you would be challenged by, that you could present as a sub-foeum of posted lessons, and that’s the ‘Famous Artist’s Illustration Course’ which you should be able to dig up on PDF somewhere. One from 1950s or 60s, when Illustration. As long as the lesson plans are largely kept offline, you should be able to post the assignment sheets and your efforts. Huge black and white emphasis and guys like Al Dorne, Robert Fawcett and others will blow your children’s minds (maybe?). Anyway, just a suggestion! I can’t be too forceful on this because I can’t guess my level of persistence here with other things going. Also, oddly enough, I can vote on these it seems, though I haven’t tried to. Great forum! Thanks for letting me in! CONCEPT: An artist is often constrained to the image/panel size required . 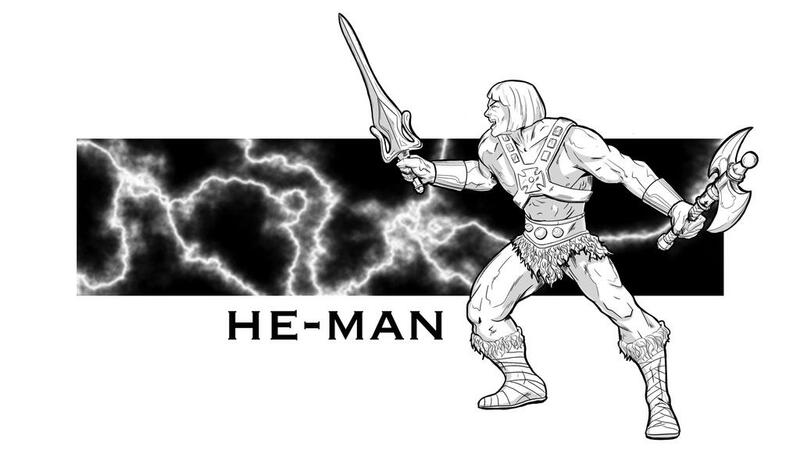 So draw or illustrate any character(s) from He-Man and the Masters of the Universe in widescreen format (16:9). Some examples of the format size would be 8″x 4.5″, 9″x5″ or 10″x5 5/8″. Don’t let the format limit you, but use it to focus your image/action! I so can’t wait to see your pieces guys.you will have to beat my piece!!! !